At AAMCO Transmissions and Total Car Care of Lancaster, we recognize that oil changes, lubes, and filter changes are some of the most critical auto services we offer. When you’re looking for an oil change place, you need trusted mechanics that are experienced at all of the kinds of auto maintenance services that not only minimize engine wear and prevent rust and corrosion, but are also critical to the continued reliability of your entire vehicle. When you come to AAMCO in Lancaster County for an oil change, lube and filter service, our mechanics will check, change, inspect, flush, and fill all the essential systems of your car, truck, SUV, or fleet vehicle. This same top-notch team of oil change service experts will recommend the high-mileage, synthetic blend, fully synthetic, or conventional oil that is most appropriate for your car or truck’s make and model. 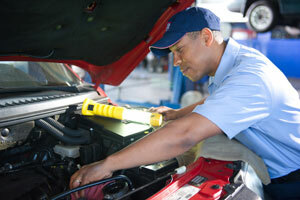 AAMCO Lancaster’s experienced auto mechanics and technicians will also perform a thorough maintenance check. Of course we’re the “oil change place,” with lots of oil change specials, but we’ll also check steering and suspension parts, examine your brakes and exhaust systems, inspect your tires, look at your transmission, and evaluate all fluid levels, including power steering fluid, antifreeze, brake fluid, and windshield fluid. We’ll also make sure your battery, radiator, hoses, wipers, and headlights are in good working order. Because these all these basic services associated with oil changes, lubes, and filter changes are critical to keeping your car or truck running smoothly, we back all our oil change services, maintenance and auto repairs with a nationally-recognized, comprehensive warranty. At AAMCO Lancaster, we offer oil change services for all car and truck makes and models, both foreign and domestic, including front-wheel drive, four-wheel drive, two-wheel drive, and all-wheel drive vehicles including light cars and trucks and fleet vehicles, box vans, cutaways, stake beds, and Grumman trucks. While oil change services, lubes, and filter change services may be considered “the basics,” at AAMCO Lancaster, our oil change place is completely state-of-the-art. That means that our experienced local mechanics use the latest diagnostic tools and equipment including computer and electrical diagnostic checks. And be sure to ask our auto mechanics about our oil change specials. We work hard to ensure that your car or truck is operating at full capacity and that all systems are properly maintained. Looking for a Special on Oil Changes? Be sure to check our website frequently for new oil change specials, or ask your Lancaster County service representative about oil change specials when you visit our Witmer Road location. Because our technicians and local mechanics are so well-trained, they can offer much more than oil change services and oil change specials. We also proactively recommend repairs. As Central Pennsylvania’s leading transmission specialist, we offer building, and replacement of both manual and automatic transmissions, differential rebuilding, and transfer case repair and rebuilding. We also provide engine tune-ups and replacement, radiator repair and service, air conditioning repair and service, brake repair and service, and transmission repair. For major repairs, we offer free towing and financing upon credit approval. Whether you visit AAMCO Transmissions and Total Car Care of Lancaster for regular maintenance or major repairs, you’ll experience professional, thorough service that you can trust. To learn more, contact us today.